Negril is located in Western Jamaica and extends from Negril Lighthouse at Negril Point in the parish of Westmoreland, to Bloody Bay in the Parish of Hanover. 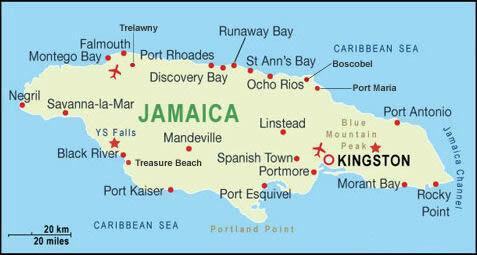 Negril is located 50 miles west of Montego Bay Sangster International Airport. The name "Negril" is a shortened version of "Negrillo", as it was originally named by the Spanish in 1494. The name is thought to be a reference to the black cliffs south of the village. Negril's development as a resort location began during the late 1950s. Most vacationers would rent rooms inside the homes of Jamaican families, or would pitch tents in their back yards. The area's welcoming and hospitable reputation grew over time and the first of many resorts were constructed in the mid to late 1960s. Negril holiday is famous for its seven miles of pristine white sand beach with crystal clear water can be found nowhere else on the island. Negril beaches have safe gently shelving golden sand and are considered the finest beaches in Jamaica. Imagine the breathtaking natural beauty and unique, laid-back spirit of Negril, no where in Jamaica is as laid back. Negril has a carefree, ideal place to meet and make friends with fellow travelers and Jamaicans alike. Visitors to Negril always return time and time again because of world famous sunsets, great Jamaican hospitality and Negril's laid back spirit. Holidays in Negril are popular with younger visitors to Jamaica and all those looking to relax in a resort with a less developed feel than Montego Bay or Ocho Rios. Negril holidays are based in a carefree low rise resort running alongside superb beaches on the western tip of Jamaica. Negril holidays also offer you the chance to play tennis, golf, horse-riding, river rafting and go on a catamaran cruises. Negril in Holiday give you a chance to enjoy its beautiful coral reefs which are popular for scuba diving, snorkeling, glass bottom boat ride and other watersports such as deep sea fishing, sailing, jet skiing, parasailing, water skiing and windsurfing. Holidays in Negril are not complete without a visit to Negril Point Lighthouse, Black River crocodiles, Ricks Cafe, Jamaican Plantations, Jamaican Rum Factory and the Bob Marley Museum.